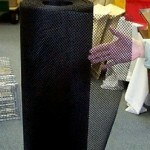 PRODUCT DESCRIPTION: Rigid, plastic diamond mesh screening that's both easy to cut and bend. Fit it to cover areas that need to be protected from animal activity like bats, lizards, flying squirrels, etc. WHERE TO INSTALL: Bottom side of soffits, gable vents, attic vents, facia boards and basically anywhere unwanted animal activity is present. DIMENSIONS: This product is sold by the foot. Each foot is 4 feet wide by 1 foot tall. 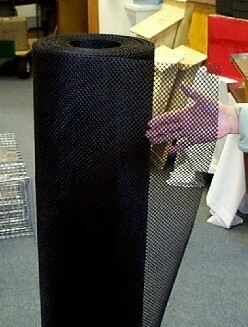 So if you purchase 4 feet, you'll receive a square piece of screening which will measure 4 feet wide by 4 feet tall. Use a heavy duty pair of work shop scissors to cut sections down as needed. You can also use a utility knife. Once cut, sections can be held together with standard plastic cable ties to create a piece as long as you need.